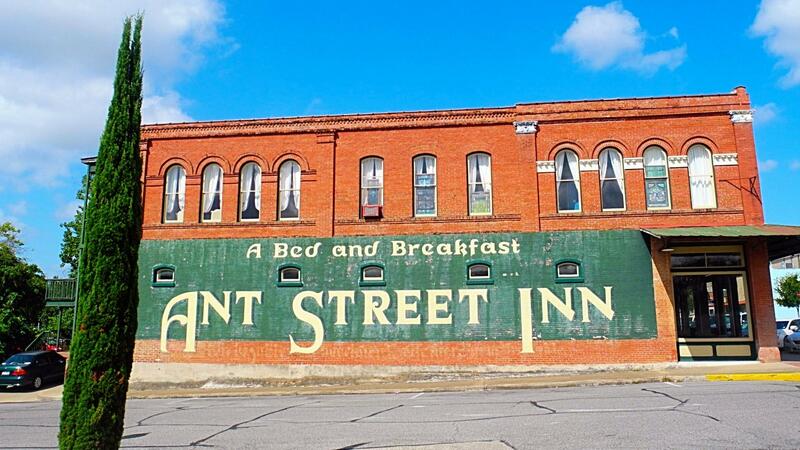 Rent Ant Street Inn | Corporate Events | Wedding Locations, Event Spaces and Party Venues. Located in the heart of charming Washington County. Our beautiful inn offers a unique experience, whether you are planning a romantic weekend, casual getaway, or special event. Spectacular wedding receptions can be held at the restored Ant Street Inn in historic downtown Brenham, Texas. This vintage building offers several locations for your reception. Wedding Reception Packages include a combination of the ballroom, garden, veranda and guest rooms. Brides select their own vendors to make their wedding weekend fit their personality. The elegant ballroom of 4,000 square feet, showcasing a stained glass ceiling dome and hardwood dance floors, is the perfect location for your reception, with plenty of room for seated diners and twisting dancers! The ballroom opens onto a 120 foot long covered veranda overlooking the gardens which provide additional outdoor space to extend the party. Maximum occupancy of the ballroom is 250 guests seated at tables, leaving enough space for dancing! A large garden arbor is available for the perfect garden reception for up to 120 guests. The covered back veranda could also be used for al fresco rehearsal dinners and cocktail hours between the ceremony and reception.